There’s so much beautiful British countryside available to see it can be hard to narrow it down, especially when you consider what Britain has to offer below the surface. I’ve found you a few of my favourite caves and gorges from the well-known to the hidden secrets and come up with a selection that’ll suit any budget and is sure to keep your little ones enraptured from the start. Not necessarily an area that would immediately leap to mind, Fingal’s Cave is a hidden attraction tucked underneath Staff Island in the Inner Hebrides. Only accessible by boat tour, it is a truly unique experience, the cave opens up to a 69 metre high arched ceiling and hexagonal basalt columns that yet to be discovered in any other sea cave. The National Trust owned cave has more than its’ fair share of mysterious and theories, not least the question of how it was formed, with some respected visitors suggesting it was carved by hand. Located towards the north of the famous national park, a captivating slate cave has been reborn from the now-defunct slave mine. Surrounded by a mining town that has redefined itself an activity hub, the Llechwedd Slate Caverns were once known as the mines that “roofed the world”. And while some of the caverns are inspiring to look at unadorned, they’re also home to the world’s largest cavern trampoline creating a surreal and enjoyable experience for the entire family. Llechwedd Slate Caverns provide an educational trip that’ll teach you about the importance of Wales in the UK’s economic history and how slate was vital to the Industrial Revolution, and keep you bouncing off the walls underground. Price: £20 for a single or £15 for a Family. Situated below the impressive Clifton Suspension Bridge in Bristol, the 1.5 mile long Avon Gorge hewn by the Avond River cuts through the outskirts of the city in spectacular fashion. The bridge itself is close to the Clifton Observatory, a wonderful lookout point to see the expansive gorge away from the bustle of the bridge itself. There’s also a small but well presented and family-friendly information centre by the bridge detailing how it was a unique feat of engineering for its time that managed to cross the gorge. The gorge has an intriguing history, having been inhabited since the Iron Age if not before and used by civilization ever since as a water source, mines, grazing area and for military forts. Price: £1 toll for vehicles, free for pedestrians. Also known as the West Wycombe caves, these are an underground setting steeped in history, known as the meeting place for the infamous Hell Fire Club, overseen by Sir Francis Dashwood who also owned West Wycombe Park both of which are now owned by the National Trust. Like many of the UK’s great subterranean attractions the Hell Fire caves are associated with a mine. A chalk mine was expanded into a larger grouping of chambers including an Entrance Hall, Circle, Franklin’s Cave (for Benjamin Franklin, a one-time junior of Sir Francis Dashwood), Banqueting Hall, Triangle, Miner’s Cave and an underground river known as the Styx which must be crossed to enter the Inner Temple. Price: Adults £7.50, Children £6, under 3s free. 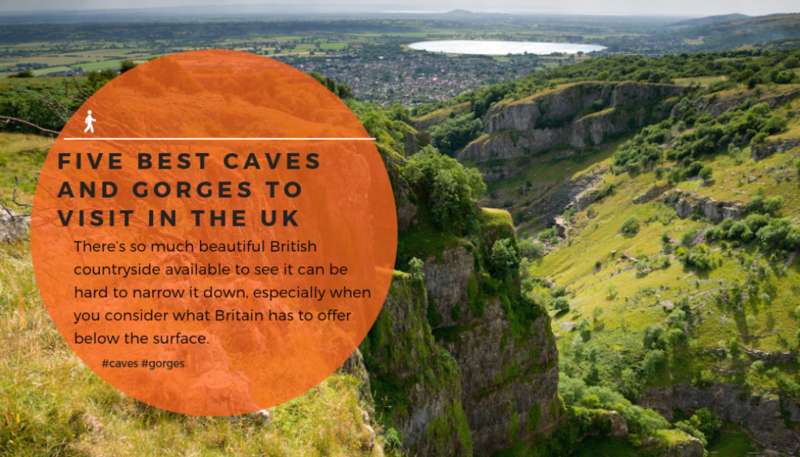 Arguably the most famous of all the caves and gorges in the UK. The Cheddar gorge is a limestone gorge located near the village of the same name in the Mendip Hills. Show caves displaying, Cheddar Man the oldest complete skeleton in Britain at 9000 years old, and various videos projected onto the walls of the caves which are a welcome learning experience after exploring the caverns filled with unforgettable stalagmites and stalactites. There’s also the cheddar cave which is used to mature the only true cheddar cheese in the world, imparting the dairy with an appetisingly unique tang you’ll taste with a free sample. A 20 minute open-top bus tour takes you across the 3 mile long 400 ft deep gorge, which also makes it England’s largest gorge and is one of the most spectacular sights available under the National Trust. One ticket covers all the attractions. Open: Daily 10am – 5:30pm July to August, 10:30am – 5pm September to June. Price: Adult £17.95, Under 15s £11.95, Free for under 5s. 15% discount if you buy online. Opening hours and pricing correct at time of publication. Dhanum Nursigadoo is a passionate traveller who's been lucky enough to visit countries across the world and travel around the UK for years. 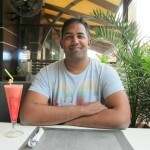 Since leaving University Dhanum has written on many topics, including finance, travel, games, and student life.